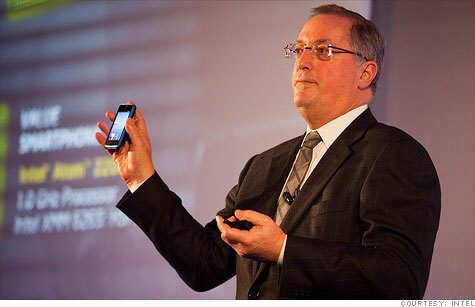 Intel CEO Paul Otellini showed off Orange's new phone, designed by Intel, at Mobile World Congress in Barcelona on Monday. BARCELONA, Spain (CNNMoney) -- The hottest smartphone maker at this year's Mobile World Congress in Barcelona isn't Samsung, HTC, Nokia or Motorola. It's Intel. You didn't know Intel (INTC, Fortune 500) designed phones? Neither did most people until the chipmaking behemoth announced Monday night that it designed a top-of-the-line smartphone for the global telecom giant Orange. It all started about a year ago, when extremely frustrated top brass at Intel decided the company could never convince anyone that its chips would work on mobile phones -- a field dominated by mobile chip designing rival ARM (ARMH) -- without proving it. PowerPoint presentations, no matter how impressive, just weren't persuading phone manufacturers and carriers. So Intel hired several hundred engineers from all over Silicon Valley and opened up a state-of-the-art phone-making business right inside the company. Late last year, Intel began to show off the fruit of its labors to the same folks who used to be subjected to slide presentations. The device -- designed entirely and exclusively at Intel's Santa Clara headquarters -- has all the key features of modern smartphones, runs Google's (GOOG, Fortune 500) Android operating system beautifully, and looks remarkably like Apple's iPhone 4S. That shouldn't be surprising. Intel's head of mobility, Mike Bell, worked at Apple (AAPL, Fortune 500) for 17 years and worked on the iPhone project before leaving for Palm. "Our device is fully buzzword-compliant," said Bell, in an interview on Tuesday. "Intel is a computing company, and these devices are becoming handheld computers. It's natural for us to get into this space." Intel built a few thousand of the phones and started handing them out to any and all potential partners. The phone did what the PowerPoint couldn't: In addition to Orange, Indian carrier Lava is planning on shipping a device based on Intel's reference design next quarter, and Lenovo launched a similar phone last month. It has also helped to finally get Intel's chips inside some important devices that Intel didn't itself design. Motorola Mobility (MMI), which is being acquired by Google, announced last month that all of its future devices will run on Intel chips. And Chinese smartphone giant ZTE said Monday that it too would soon begin to ship phones with Intel inside. So now that Intel is a successful phone maker, will it continue in that realm? Or will it focus more intently on chip design? Probably a little bit of both. "Our plan is that with every new generation of chip, we'll build a state-of-the-art reference device," Bell said. "If customers like what they see, we'll certainly support that." It's actually not such a new strategy. Three decades ago, when Intel had to convince emerging personal computer companies that it could make PC processors -- a laughable thought now that it dominates 80% of that market -- Intel actually designed whole motherboards in house and showed them off to potential partners. The same was true for laptops in the 1990s. Like today with mobile phones, some companies liked the boards and notebook computers so much that Intel continued to secretly make them for a while and brand them under the PC manufacturer's name. With ARM claiming that its chips are on 95% of all phones, Intel still has a lot to prove. But whether Intel can power smartphones is no longer a question.